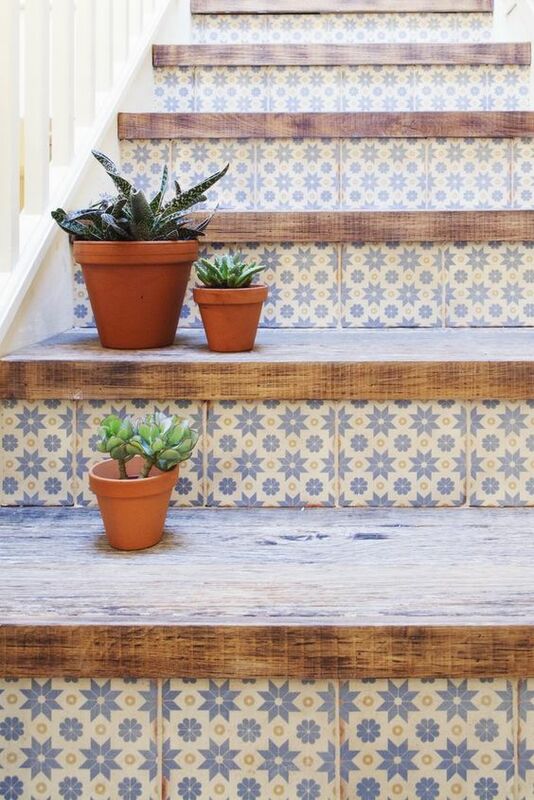 Now that you’ve got a little sun shining in your home, try incorporating a little more plant life. Find your sunniest window and pepper it with plants that enjoy full light. Creating a sunroom is easy once you’ve got a general theme to go with. Check out our quick plant guide and then hit the local nursery! Not only will the Feng Shui of your home improve, your mood will be instantly lifted as you care for your new little plant pets. It’s taken me many years to understand which plants like light and hot much water to give. 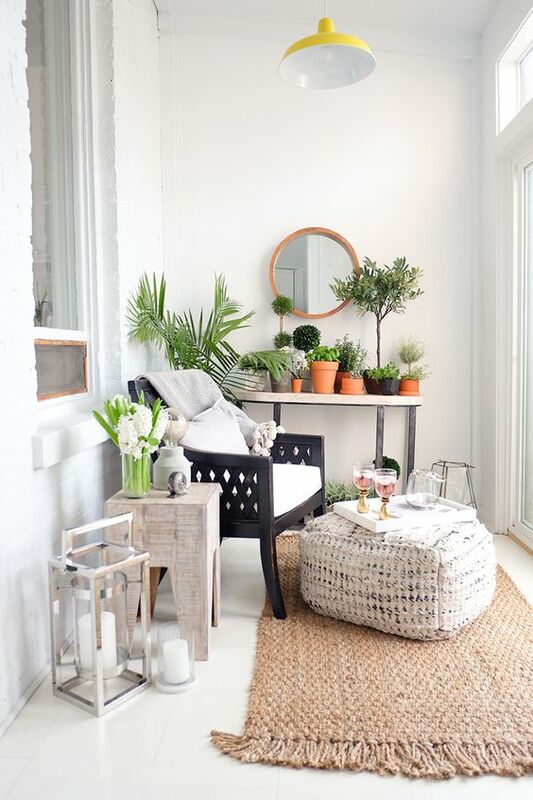 Check out BuildDirect’s article, 8 Plants That Thrive in Sunrooms for an easy guide to help you before you go shopping. Once you have your plants home, make sure they stay alive in your sunroom by regulating watering. I have two basic secrets for watering that turned my thumb from black to green. Firstly, I keep a large spray bottle of water under my kitchen sink. I give my plants a few sprays (1 spray for every 1″ in diameter pot) every morning. Even succulents like this treatment. The best thing I have ever purchased was a Moisture Sensor Meter from Amazon. Simply stick the hydrometer into the soil and let it help you determine how thirsty the little guy is. You’d never believe how much I used to over water! If your home includes a sunny covered porch, consider me jealous! The easiest way to create a sunroom on a covered porch is to minimize use of furniture. One comfy sofa or a pair or chaises are all you need. Remember to keep things light and let air flow in and out easily. Add a tall tree and a few plants along the window sill. Especially if your sunroom is in the Family center of your home! Feel free to add a vine-creeping plant that can grow up and around as you please. 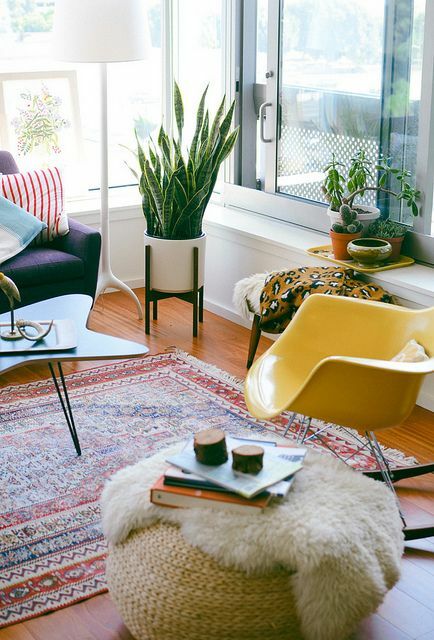 If you prefer the easy look of Bohemian decor, use low-sitting furniture and floor pillows instead. 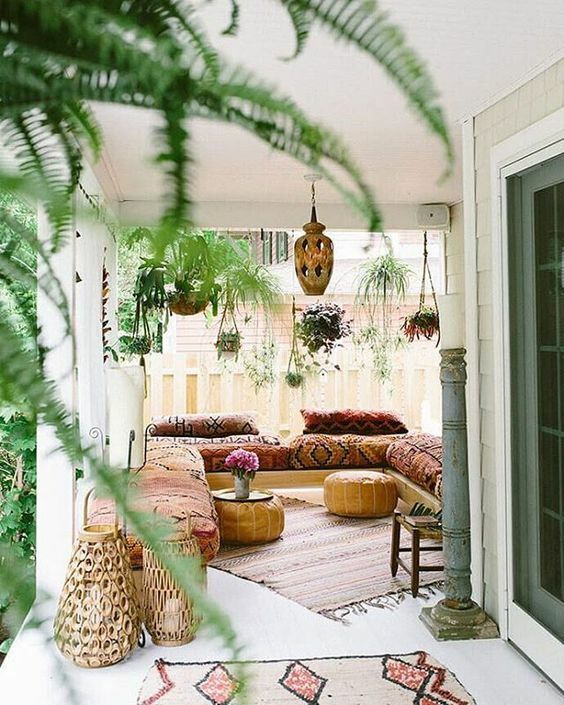 Hanging plants look amazing in a sunroom and add depth to otherwise empty space. Check out our DIY article on Kokedama for a new twist on succulents and hanging plants. They are so cute and easy to care for! Fabrics and rugs should be natural and layering works great, too. For a real conversation piece, hang a Turkish lantern (or multiple lanterns if you like). Be sure to check out our recent article on Moroccan lamps for more inspiration. Creating a cozy space in a sunny area is always a worthwhile use of time and energy. We can’t get enough of hammocks indoors! You might have seen one in our recent Feng Shui article for the Career center. 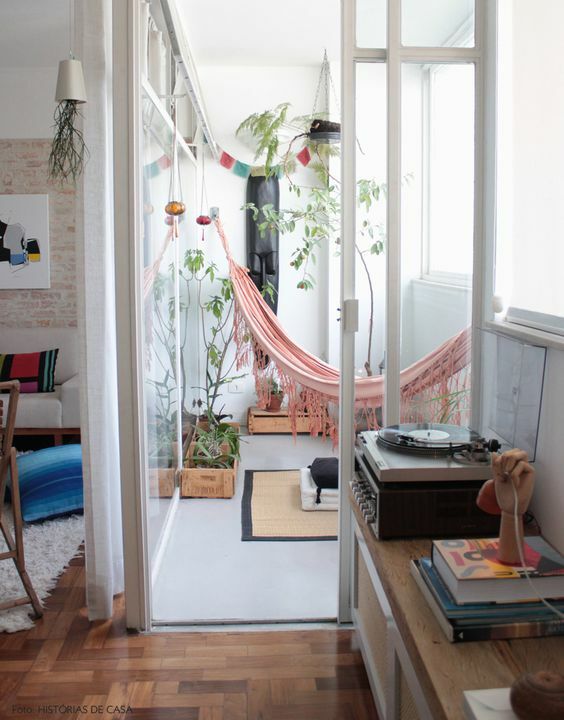 A hammock is the perfect addition to a tiny sunroom. Keep your turntable and vinyl nearby and create a lazy atmosphere that speaks to your heart. Plant life should be thin and wispy to keep the room from looking too cluttered or heavy. Use your plants to fill in gaps and step back as you work to make sure you don’t overdo it. Less is more when it comes to hammocks indoors! Sad like me and don’t have a covered porch? 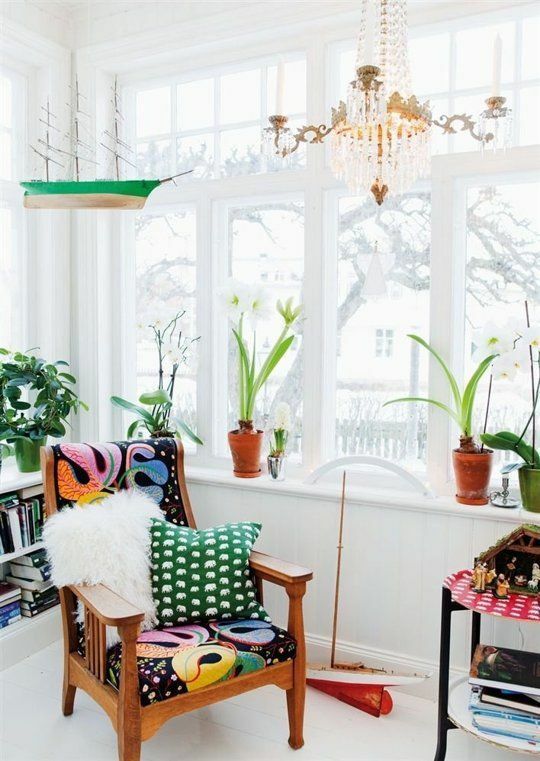 You can still take advantage of a bright corner in your home and carve out a sunny little sitting nook. Give furniture in your sunroom area a relaxed feeling by setting things on angles. Make sure to leave some empty space to stretch out on the floor. An area like this is perfect for taking a time out! Refer to our Meditation 101 guide for some quick tips to help you clear your mind. Meditating for 5 – 15 minutes a day is all it takes to boost creativity and productivity. 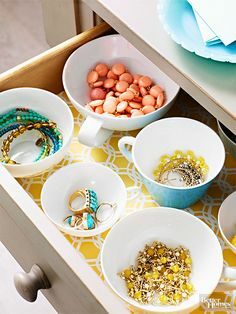 Finally, no matter what your decor choice is, make sure to keep things on the up-and-up! Your sunroom should be relaxing or cheery (or a combination of both!). Balance your plants with care and give them plenty of breathing space. No matter what your style is, a sense of minimalism should always prevail. For an upbeat room that provokes conversation, use furniture with bright fabrics in comfortable arrangements. Keep a stash of reading material nearby and keep the space clean and those plants in prime condition! They deserve it, those sweet little guys, and so do you. With Easter around the corner, you might be feeling a little overworked. 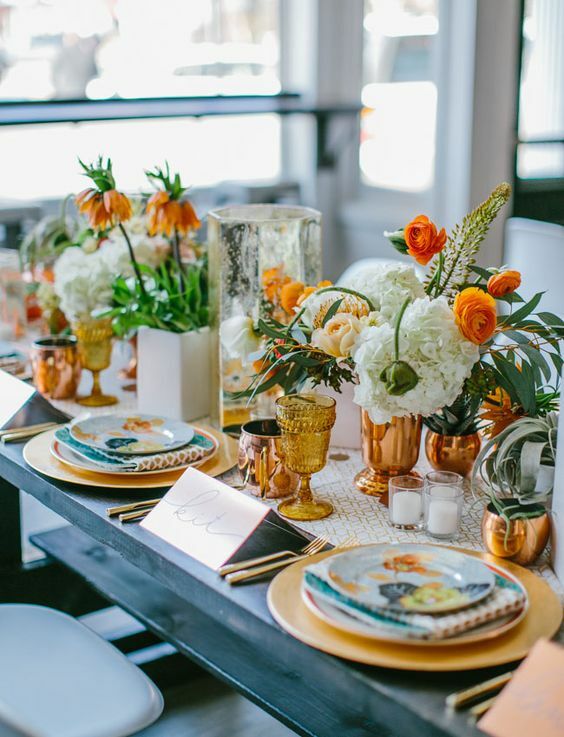 Hopefully our articles on Spring table settings and the perfect day planners were a help. 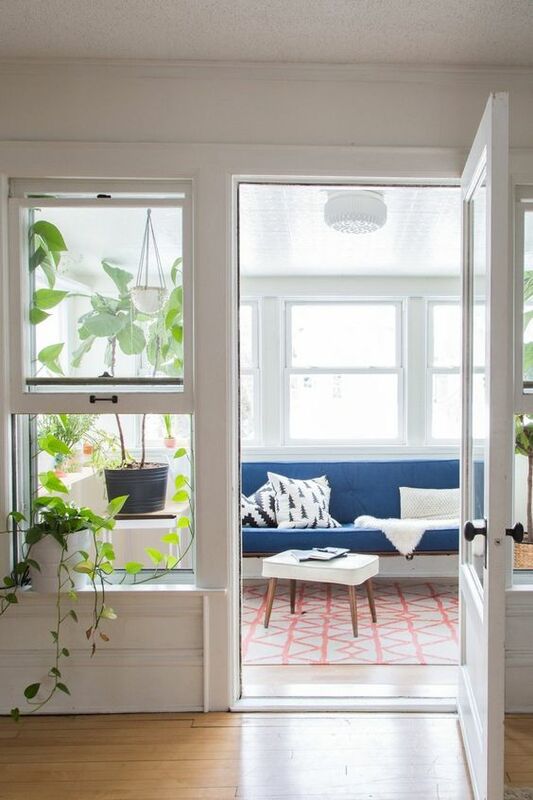 Creating a sunroom effect can be as simple as grabbing a chair and a plant and setting them by a sunny window. Then you’ll have a place to unwind here and there and it will do a lot to rejuvenate you! Take care of yourself, and happy Spring! My family wants to add a sunroom to our home, but we aren’t sure if this is a good idea. 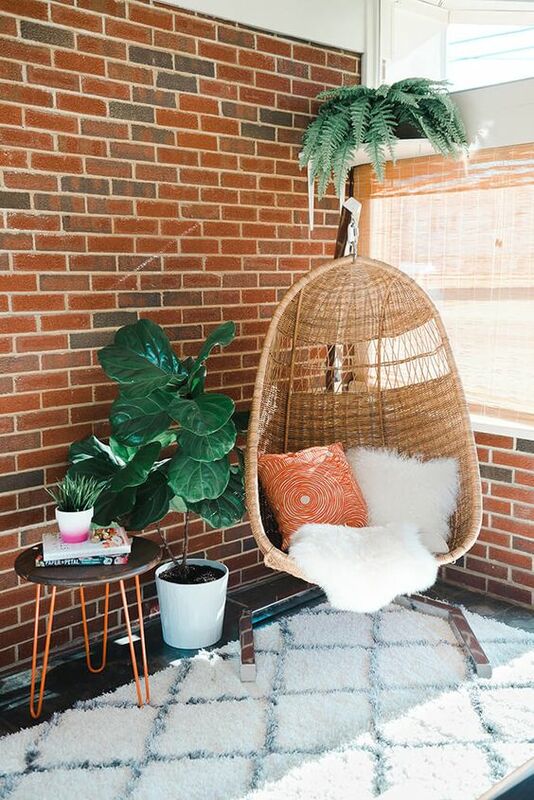 Your article had some great information about some great things we could do in a sunroom, and I liked how you said that a hammock is great sunroom addition, and to add thin wispy plants to fill in gaps without making it looking to cluttered or heavy. Thanks; we’ll keep this in mind if we ad a sunroom to our home. 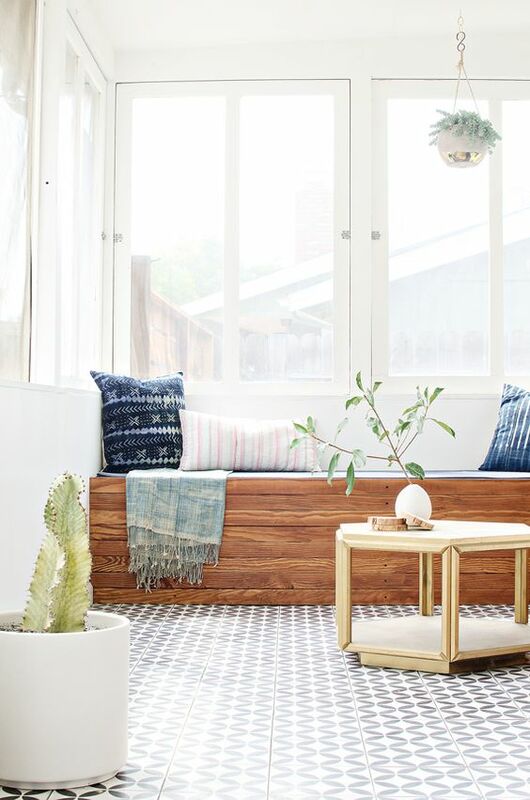 try carving out a little nook by a sunny window first. then see if it gets used enough to be worth dedicating a whole room to the idea!